The following is adapted from Thinking Together by Rozlynn Dance & Tessa Kaplan. We believe that one of the most important factors in successful student-centered instruction and learning is perseverance. For students to be successful mathematicians, they must be willing to struggle through mistakes, take risks in their learning, and try again when things don't quite work out. In his 2010 TED Talk, Dan Meyer discusses the importance of helping our students learn to be patient problem solvers. Children of the twenty-first century are used to quick problems with easy solutions, but real mathematical problems don't work out that way. We need to teach our children to tackle complex problems worth solving and persevere in solving them (Meyer 2010). According to Jo Boaler (2016, 13), "Studies of successful and unsuccessful business people show... what separates the more successful people from the less successful people is not the number of their successes but the number of mistakes they make, with the more successful people making more mistakes." When we teach students that mistakes not only are okay but are steps on the path to success and innovation, we help build perseverance. As mathematicians, we want our students to be able to try different paths to a solution, to experiment with new strategies, and to keep trying until they find an idea that works. We believe that if we let our students give up after the first try or get overly frustrated when they make a mistake, we are doing them a great disservice. The same goes for when we dive in to save them, correcting their thinking or giving them the answer. We are not doing them any favors by bailing them out when they are struggling. The structures we set up in our classroom and the community we build can support our students as they persevere through productive struggle, encouraging them to continue to persist when things get tough. In order to construct knowledge and deepen understanding, students must be able to talk about their learning and understand the ideas of others. The Common Core Standards for Mathematical Practice (CCSSO 2010) specify that students should be able to "construct viable arguments and critique the reasoning of others." When students can justify their own thinking and explain their ideas to their classmates, they are deepening their own understanding of those concepts. When they can critique the reasoning of others, students show that they are thinking deeply about mathematical ideas, making connections between their own thinking and the ideas of others. On a more complex level, students must not only be able to talk to and listen to one another but also be able to work cooperatively in partners and groups. They must find and build upon the strengths of others, which in turn strengthens their own skills and understanding. Students need the skills to be able to work with one another as they think creatively and problem-solve together. It is our job as teachers to ensure equity of voice among all our students, regardless of skill level or ability. We know that when we encourage cooperative learning, there is a tendency for some students to dominate the discussion. Therefore, to be effective teachers, we must have a variety of techniques on hand to encourage all students to contribute to a discussion (Danielson 2014). Developing those skills requires deliberate and clear structures to be in place in the classroom. The study of mathematics is not just about finding answers but about figuring out ways to solve complex problems successfully. Simply put, the process is more important than the product. Because of this, it is important that students take ownership of their learning process as the teacher steps back from being the center of knowledge. When students learn to think meta-cognitively about their own processes by comparing, critiquing, and justifying them, they begin to trust themselves as learners. They don't need an answer key in the back of the book because they have chosen and use strategies that make sense to them. They have checked their answers on their own using different strategies and critiqued their answers to be sure they are reasonable in the context of the problem. When students are more focused on the process of math, the correct answers come more naturally and fluidly in the course of time. 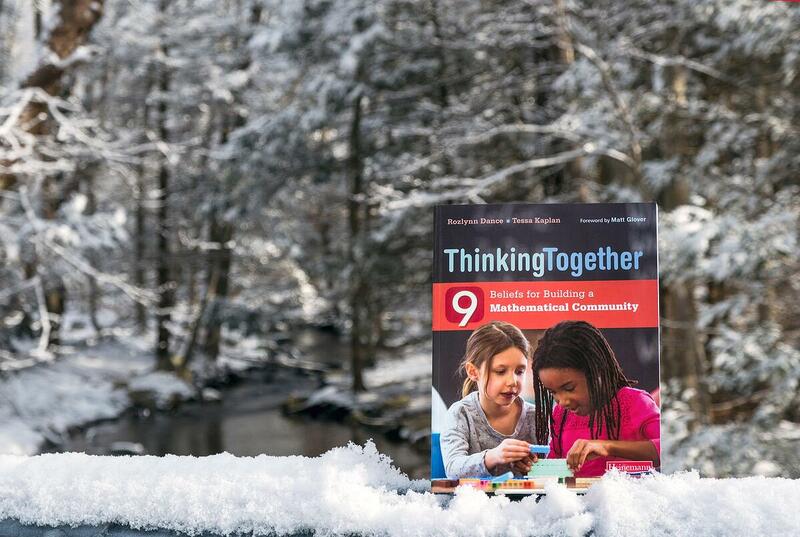 To learn more about Thinking Together and download a sample chapter, click the button below.